I’ve been meaning to load XBMC on my xbox for awhile and use it for a media player in the bedroom but I never got around to it because all the instructional material that I had read said I would have to scour used game stores for a very specific version of MechAssualt or one of the other games that allow you to softmod the original xbox. Turns out I didn’t have to. I did some reading and found a way to mod my original Xbox without having to purchase anything at all. 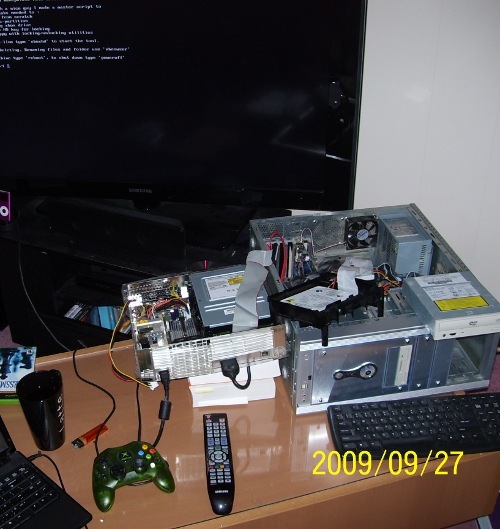 The technique is called hot swapping and it involves attaching the Xbox hard drive to a pc and overwriting the dashboard. The only real problem with this method of modding the original Xbox is that the console’s drive is normally locked. If you just take the drive out of the Xbox and hook it up to your PC then the drive will not work. That is why it needs to be swapped when hot (powered up). When the Xbox is in the dashboard or running a game then the drive becomes unlocked. When I swapped my drive I was in the middle of a Chessmaster game. Apparently this can be dangerous to both the PC and the Xbox so it’s recommended to either jumper the two cases together or supply the Xbox drive with power from your PC’s power supply. The entire process was surprisingly easy and once I had finished reading every thread I could find on the topic I had my Xbox streaming family guy with XBMC in about an hour or so. The only down side so far is that the fans in the Xbox seem to be on full output always and it’s really loud but apparently there is a fix for that. Obviously I had to open up both the Xbox and my PC. There’s a very descriptive tutorial on how to open the Xbox at this Xbox site. I can’t really say that I didn’t buy anything because I did end up purchasing a #20 Torx Screwdriver. I only had to pop off the cover of the Xbox and take the harddrive section out. I did not remove the drive from it’s plastic enclosure. With the PC, I disconnected all drives and left only one DVD-ROM connected as the secondary master. As far as software and explicit instructional material go I loosely followed this Xbox hotswap guide. I used version 3.1 of Ndure as opposed to 3.0 like the guide suggests and the options were a little different but still pretty straightforward. I had a problem here where I got banned for the xbins IRC channel and couldn’t rejoin but I used a web based efnet client and managed to get back in. I also was unable to get any software from the xbins server unless I used FlashFXP. Other FTP clients wouldn’t let me download anything. By default, after the installation, the new dashboard is UNLEASHX. The sounds are hideous and it looks really bad but it gave me ftp access and seeing it meant that I didn’t break anything. After putting everything back together the first thing I did was install XBMC.